In June we had him 4 years. He is the sweetest, smartest, most affectionate and definitely FUNNIEST dog we've known. He used to pop right up on the table when we got him. He is agile like a cat! He knows he is not supposed to do that, but occasionally he loses his mind and does it again. We had 50 people here for my 50th birthday last year. For the end of the evening, desserts were on the table and he was nearby whimpering occasionally all night.When Karl and I walked our last guests to the door at 3 AM, we heard a crashing sound. We came upstairs to find him standing on the table eating cake! He's so darn cute you can't stay mad at him! At night he makes his rounds. He always starts out in a little nest he makes in our 13 year old's room. Sometime during the night, he comes into our bedroom and either goes in his bed, or when it is colder he gets in between the 2 of us.He ia quite a sweet little snuggler. He knows the sound of our cars and it is so heartwarming to find him in the window waiting when w pull in the driveway. We still crate him if no one is home and he destroys all dog beds/mats.Momma keeps buying him new ones! He destroys dog toys in under 5 minutes. Luckily, he only destroys his own stuff and not ours. Oscar has food allergies and we keep him on special food. He LOVES fruits and begins so I always share with him since I can't give him chicken or meat. He can smell a banana from the other end of the house! He gets a KOng when he is crated with frozen sweet potato and loves it. He can hear a bag of potato chips being rustled from anywhere in the house. His special time with Daddy is sharing chips in front of the TV together.We are head over heels in love with this dog. Sadly, Oscar's sheltie brother Bluey has cancer. we have known since February. He has good days and bad. Right now, he has had a few bad days in a row and we are sad at the thought of saying good-bye. We hope to add another BT in the future. Thank you for saving him! We can't imagine anyone giving him up. He is so special. We are grateful to NEBTR and also Beth and Jim McFadden for fostering him. We would like you to meet the love of our lives! This is Spike! Thanks to NEBTR and the Cassner's Spike has gone from a scared three year old pup to an amazing addition to our family. 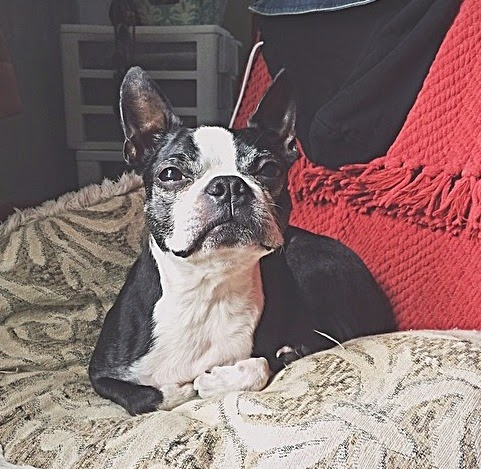 He has an older Boston brother named Rocky, a brother named Gregory and a sister named Brooke. He LOVES boating!!! He also loves his morning eggs for breakfast with his daddy! Once again thank you for saving our little Spike for us!! Popeye's gotcha day will be in October. I feel blessed to have him as part of my life. I fell in love with Popeye when I saw him on NEBTR's website, but was worried about his special health needs (he had meningitis as a puppy and has neurological damage). I am so glad I took a chance and opened my home and heart to this special little dog and have been stunned by his growth. His wonderful foster mom's noted that he seemed to be getting stronger while they were caring for him, and he has continued to get stronger. Popeye can now go on hour long walks in Valley Forge where he likes to hunt down frogs, sprints around the yard like a little maniac with his doggy sister Sophie, eats solid foods with no issues (and does a hilarious hopping dance while waiting for his meal), and is learning basic commands. Popeye is a happy little guy who is my cuddle bug and brings a smile to my face every day. Popeye's resiliency reminds me to never give up and make the most of each day. Both my life, and Sophie's life, is happier and more full now that he is a part of it. Thank you NEBTR for rescuing Popeye and bringing him into my life! Here is a couple of funny pictures. Katie (far right) and my other two dogs for my Christmas card and a caricature portrait I had done in Bangkok last summer, drawn from some photos I gave the artist. Today is Elena's third anniversary with me and, as I have said since I adopted her, I can't imagine my life without her. I picked her up from her foster mom, Elly, on August 13th, 2011, and by the time I got the first rest stop to fill up my gas tank, we had already bonded, and haven't spent a day apart since! She is full of life! She turned 11 this past June, but you never believe she's a day over 3 years old! She is truly young in body and mind. Mornings are her favorite time of day. I get up for work during the week at 5 am, just early enough to spend some time playing fetch with her before getting ready for work. Come Saturday and Sunday, she's up at 5 am, again, toy in her mouth, ready for a game of fetch! She doesn't seems to understand that I like to sleep in a bit on the weekends!!! She is never without at least five toys around her at all times, her favorite being her many Kong Wubbas. Elena always brings a smile to my face and is all smiles herself! 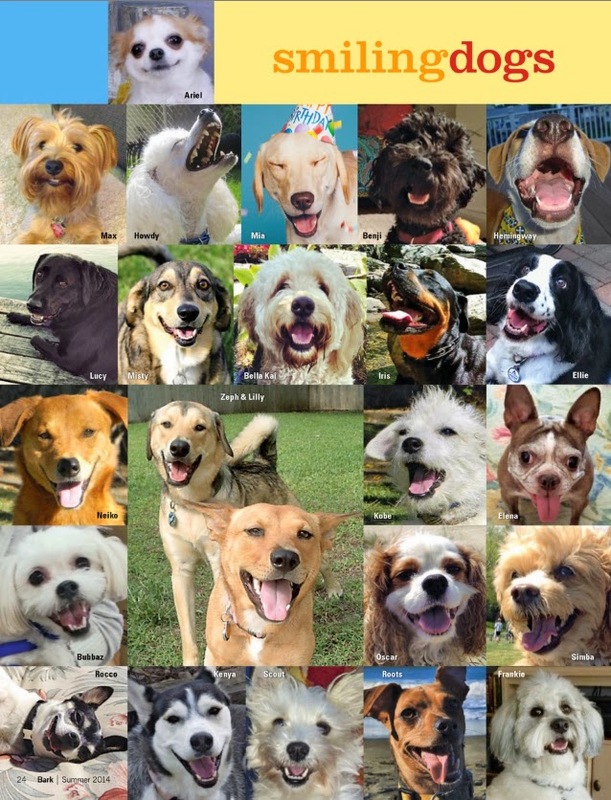 In fact, recently, Elena was honored by Bark Magazine's 2014 Summer Edition as a Smiling Dog! 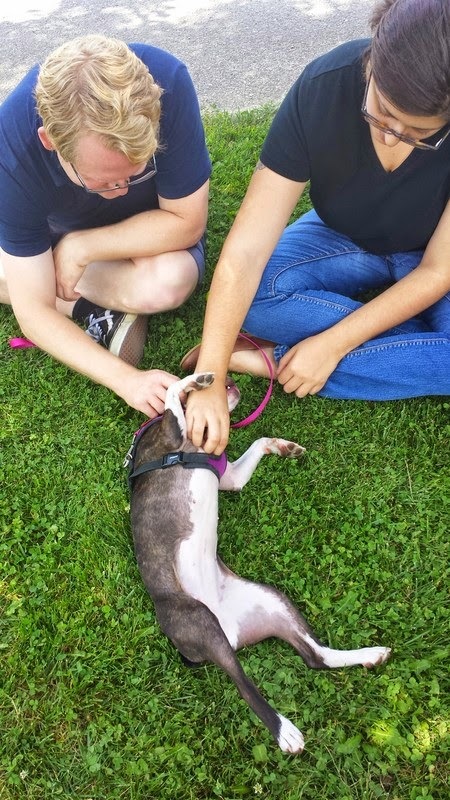 I originally applied to adopt another dog, but as fate would have it, that dog was no longer available, and after some careful consideration of her temperament and my lifestyle, NEBTR suggested Elena. Thank you, NEBTR, for choosing Elena for me. We are a perfect match!! Yesterday morning - the Brooklyn ACC. This morning - chewing on the lamb toy Rita Weeks, who pulled him from the shelter, got him. That is wonderful! Great job! Thank you for that update on Maverick Shawna! He is so cute I just love his face. He seems very happy with you! Great job with him. Beau was dropped off at the Brooklyn ACC and quickly made his way to Facebook and the Urgent list. He is 9 years old, intact and just 14.9 lbs. Poor baby was so frightened in the shelter! Rita Weeks pulled him and will hold him until Tuesday 8/19 when Julie Klam returns from LA and can foster him. Rita was kind enough to offer to go there and pull him and temporarily care for him - I took her up on this to get him out of the scary ACC. Huge thanks to Rita for acting so quickly and thank you Julie for offering to foster Beau the BT! 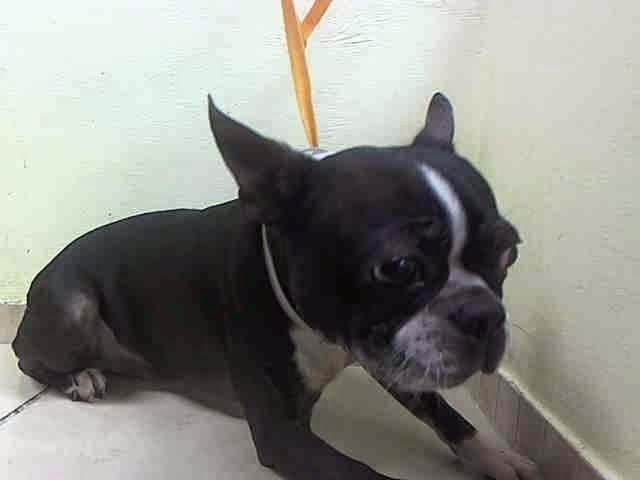 Above is his picture at the Brooklyn ACC, looking so scared and frightened. But look below at his photo with Rita! What a difference already! It definitely takes a village! I'm not quite sure how I ever arrived here but I'm here. I once had such a wonderful life laying at my masters feet. romp through the open fields. You tossed a stick and I proudly brought it back to you. I so remember those chilly nights lying by your feet feeling thewarmth from fireplace heat. Your gentle touch as you rubbed my head. As the fire dwindled I soon knew I would follow you to my special place beside your bed. As time went by we aged you and I, we don't go quite so far on our walks these days. But never the less I still love your gentle caress and my special place by your bed. Soon you went away and I never saw you again. I patiently lie by my special place by your bed. I don't understand why you won't come back to me again. A nice man soon came me to take me away. In a soft voice he said sorry old timer I have to take you away. As I lay on the cold hard floor my thoughts were only of you. Our wonderful walks seemed like just a memory. My eyes are cloudy and I can't hear at all. Oh I miss the gentle touch of your hand. Oh I miss the gentle touch of your hand. hands. It's then that I realize we will never be apart again. I knew you would not leave without me.... were together again. Good news about foster Indiana Bones' vet visit on Friday. The vet said his back and knees look fine, his corneas are clear. Although his eyes were a little red, she showed me that the whites were very white when she gently lifted the top eyelid, so his eyes were fine. She said the visible redness didn't need treatment. It could be an allergy to grass. Treatment would be for cosmetics; he doesn't really need anything. Indiana impressed the vet and vet tech with his friendly behavior. He tolerated the blood test and rabies shot well. He was very excited to be at the vet's office and wanted to visit with everyone, but eventually was satisfied to sit with me. The vet's office called this evening with the news that his test results were all good. The titers show that he doesn't need any boosters, plus he was negative for heart worm. YAY!!! Just wanted to introduce myself. I have only been in my foster home for one week. I am settling in and getting comfortable. I am 5 years old and soon will be looking for a family of my own. About an hour after they left I received an email from them saying that they would love to adopt her. Saying that, they "will be able to provide a great setting and all the attention, activity, and love that she needs to thrive." 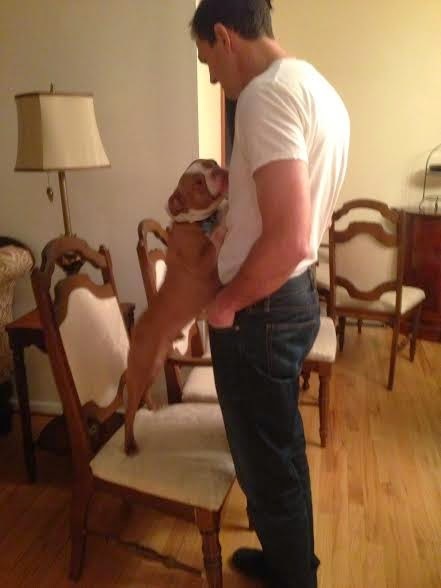 All great things to hear from an adopter! It makes me feel really good about her new home. We're going to set up September 6, 2014 as Adoption Day!! Miss Remy received her blanket and crackle ball toy on Saturday. Thank you so much to Leah Weinberg and Marc Brown for your generosity. Remy loves her gifts and sends loving kisses to both of you! Attached is a cute pic of Remy snuggled in her blanket and a short video of her enjoying her new toy. We couldn't resist Penny and we did adopt her :) Penny has been a blessing to all of us. She has also given me the confidence and the motivation to continue to foster. As soon as she is fully socialized, we will be able to open our doors to another foster in need. The next step is to work with her and other kids. She has so much love in her heart, she just wants to kiss everyone now, I believe I can work her to become a therapy dog. I do have high hopes for her and I am very excited that our goals have been met way ahead of schedule. I keep telling my grandson that by Christmas she would be sitting on his lap. Well she did that today and I posted a video on facebook of the 2 of them playing on my bed. Just to think that last Christmas Eve, 2 days after she came in to our house as a foster, she could not be in our family room, not even in a crate because she would go crazy just looking at my grandson or any other kid!! Siobhan Huck, her husband, their little boy, and their pug Mason came to meet Ellie today. Of course at first it was all barking from Ellie, (all directed at Mason) but she settled down, we went for a walk together, and ultimately she decided he was an ok guy. She liked the human son immediately, and licked him like crazy! That kid never has to worry "do I have food on my face?" Ever again. Hoorah! This family knows their stuff, and will continue to work with Ellie on her walking manners. I am thrilled she found a perfect match! Thank you Erin for all that you have done for Ellie and so many of our pups! Hello everyone my husband and i have made the decision to adopt Caesar. He just touched us in a way I can't explain from the moment we picked him up . And our pack just loves him as much as we do . And to think when I first got the email about him I was a lil worried how they were all going to get along . Because we were told he was very rough . And that turned out not to be the case at all .. But I do know he will get a lot of love here and will never have to worry about not having a home ever again . He is a true love bug . Thanks for all you do for these amazing pups . What a happy day this is for Caesar! Lucky dog for sure. Thank you Best Bully Sticks! !